There aren't many things worse than dealing with unfinished work when that work is out of your control. The perfect example of this is when any type of asset owner - whether it be a small building project or a mega-project - has work left unfinished by a contractor. Contracts, scopes of work and other contractual documents are put in place to protect asset owners and operators against this, but there are still times when a contractor does leave a project or site with work unfinished. While this can be extremely frustrating (and potentially costly) for the asset owner, this unfinished work can also be difficult for the contractor to manage and include some external forces largely outside of their control. For this reason, it's important for the project owners to communicate with their contractors about this unfinished work in a cordial and professional manner. A letter to a contractor for unfinished work is often the first or second step in attempting to solve the contractors unfinished work on your projects. The first step is often an attempt to discuss the issue over the phone or in person. If this is not possible, then the issue often warrants a firm but amicable letter to the contractor. The contents of this letter should be pretty straight forward, and we will look at a sample letter to contractor for unfinished work below. If the contractor does not respond or action the letter, then you or another person or party may need to escalate the quality, safety or commercial issue, which can involve complaining to official authorities or heading down the legal route. 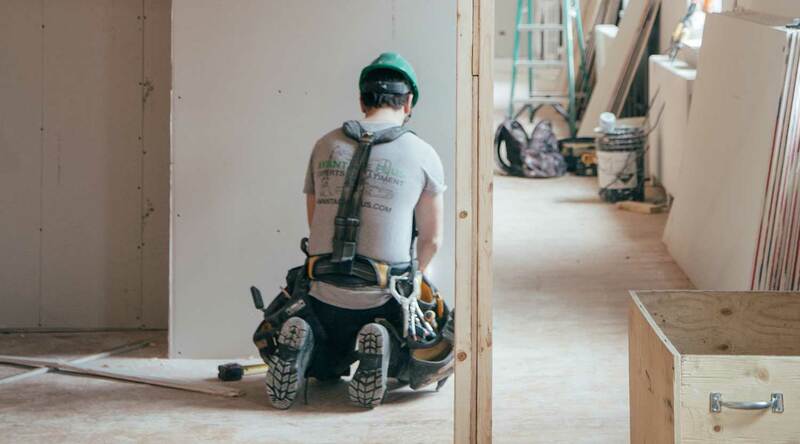 Dealing with contractor for unfinished work is not ideal, but it can happen for many reasons, so make sure that you have access to a letter to contractors for unfinished work you can use and rely on to move this unfinished work along and get your project completed as planned. 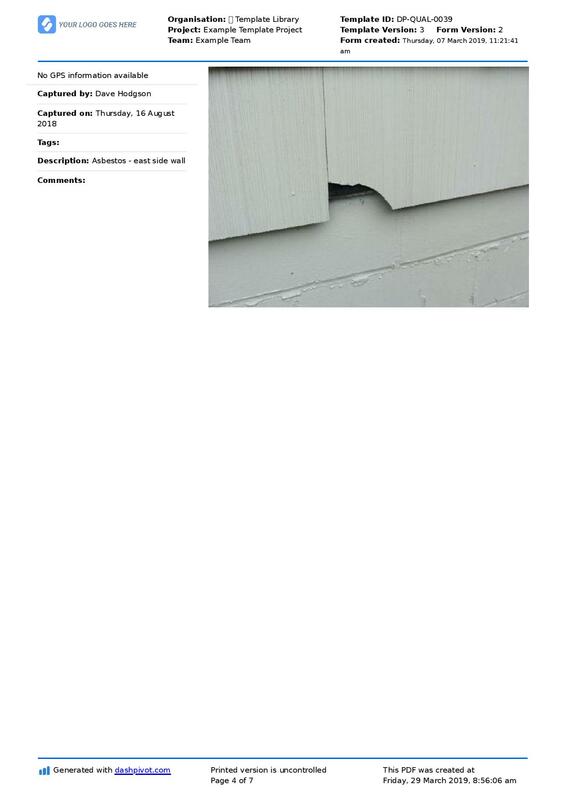 The sample letter to contractor for unfinished work below is a great example of what your letter should look like. This sample provides you with a flexible framework which you can use and adjust for many different unfinished work issues. Where there is an example in the sample e.g Camden Road Upgrade project, simply replace that with the name of your project. If you include these key elements, in a format similar to this sample letter to contractor for unfinished work, then your letter will find the perfect balance between diplomatic and firm. You may even adjust some of the contents and tone based on your relationship with the contractor, but it's good to keep your letter format as standardised as possible no matter what has occurred on the project so far. 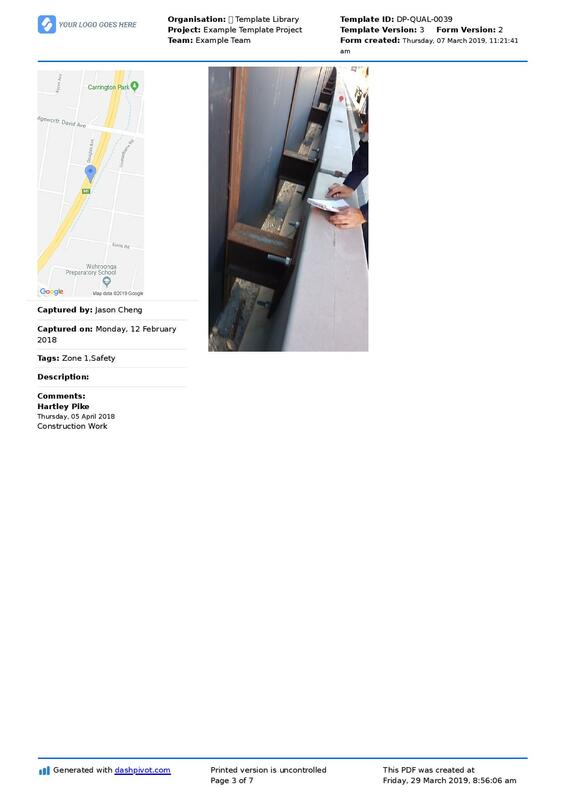 On [Insert contract date], I/we entered into a contract with your company to complete the Camden Road Upgrade project. Unfortunately, the work has been left unfinished, with the roadside barriers not being cleaned and finished in accordance with the contract specs. We would appreciate if you could organise your company, teams and workers to complete the work as specified in the contract by [Insert date]. You can contact me on [Insert contact details] to discuss or arrange a time to talk. I look forward to settling this matter amicably. If, however, you choose not to undertake the rectification work required by [Insert date], I will consider taking further action to resolve the complaint through the Department of Commerce or the Building Disputes Tribunal. Letters like the above sample letter to contractor for unfinished work still work really well in the construction industry and for any issues or disputes. A letter or email is a trusted form of communication which can be relied upon as a source of proof. In saying this, there are some downsides in communication delays to contractors and unfinished work to contractors in a traditional letter format. If you are looking for a better way to manage these types of communications over and above letters to contractor for unfinished work, then proper quality and commercial documents like the example you see below can work really well. 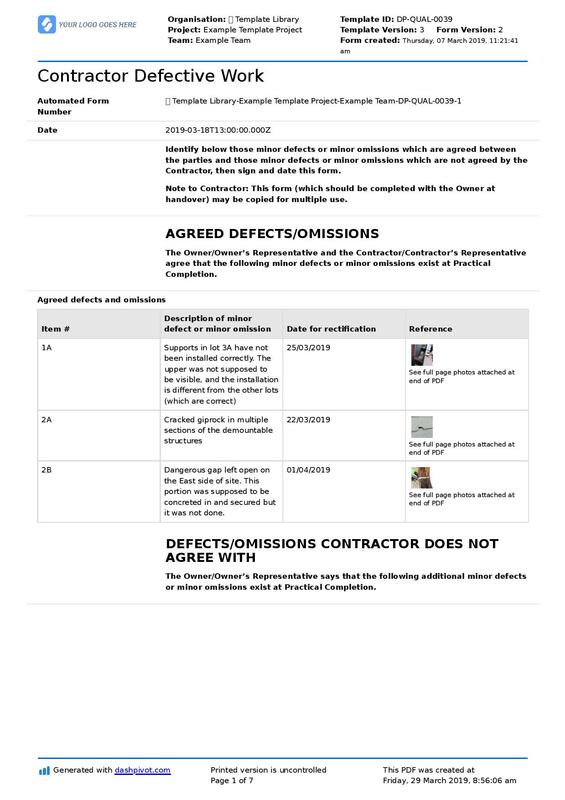 You can see that in this document, the asset owner and operator is able to get really specific about the defective work, outstanding issues or unfinished work. 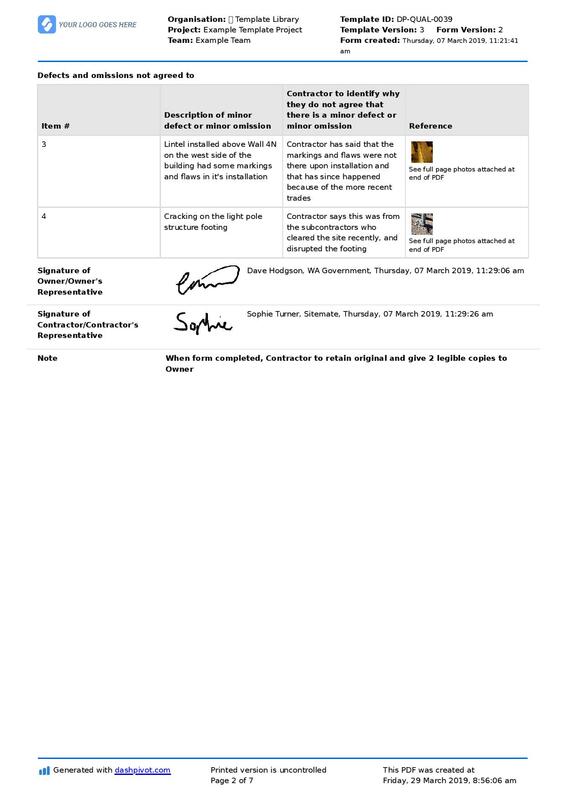 Each 'item' which needs to be flagged with the contractor includes a description and photo evidence. The contractor and project owner can also communicate and collaborate directly on the document for unfinished work, reducing the lag between communications and getting issues resolved faster. All parties prefer using communication methods like this, because they bring a new level of transparency and understanding to the issue - and remove the uncertainty associated with communicating via basic letters. Issuing a document like this to a contractor for unfinished work, alongside a letter is a really good combination. It serves to formalise the communication, and gives both parties the structure and detail they need to better understand the problem - and get it fixed quickly. Use this smart framework instead of a letter to contractor for unfinished work. The goal of a letter to contractor for unfinished work is of course to get your job finished properly and to the standard you expect. But the goal of construction management, before tackling any contractor issues is to have work completed properly the first time, and to get projects delivered on time and on budget. So when looking at your letters to contractors for outstanding issues and unfinished work, it's helpful to look at how the project could have been better managed to avoid this step altogether. While this can be more difficult for home owners and non-experienced asset owners managing projects, there are tools in place for larger scale project management companies and asset owners and operators which make it much easier to keep tabs on the work which is being left unfinished or getting delayed by a contractor throughout the project. And some of these tools work extremely well, as you can see in this case study of CARAS, one of Australia's leading remediation project management consultancy. Using these smarter tools, project management firms (for which an asset owner always is) can get real-time updates and insights about their projects at all times. When mandated, contractors can fill in daily reports, take progress photos and file quality management issues and defects. The asset owner can then see all of this information and these records in real-time, in addition to being able to complete their own audits and site inspections using the same software. The reason that unfinished work rears its ugly head at the end of projects and results in letter for unfinished work and other disputes and issues is because the contractors, project managers and other parties don't have the tools they need to be able to understand what's happening in real-time. If they did, project communication and collaboration would be drastically improved, and all of the records and proof would be consolidated in one place so that unfinished work didn't need to be escalated to a contractor letter (or legal issue). While there is always bound to be the odd letter to contractor for unfinished work - sometimes to the fault of the contractor and sometimes for other reasons - all parties can do a better job of managing the project during project delivery to avoid these end of project headaches and disputes. Use the sample letter to contractor for unfinished work if it helps you to clear up an urgent issue or piece of unfinished business, but also think about how much easier it would have been to solve this problem if you had a system in place for staying on top of everything automatically. Document, assess and share contractor performance more effectively using this smarter contractor performance report template. 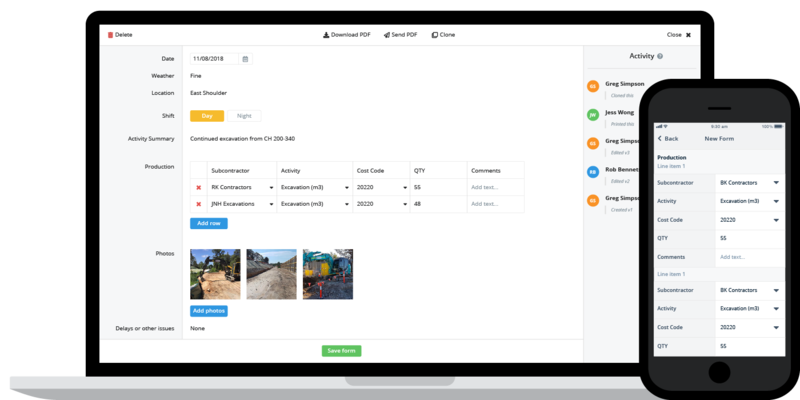 Sitemate enables companies to manage and deliver projects more efficiently, so that projects get delivered on time and on budget with no unfinished work.